Below are some systems that can be achieved by using SureCrete’s products. Although there can be many variations of product uses, SureCrete has most of the products to complete a system from start to finish. Changing the way concrete floors can look, SureCrete helped change the industry featuring 3d Metallic Floors in 2016. With its unique look and durability, these floors can be accomplished using the products below. ColorTec Water Based epoxy coating is a common base coat for the metallic floor system. 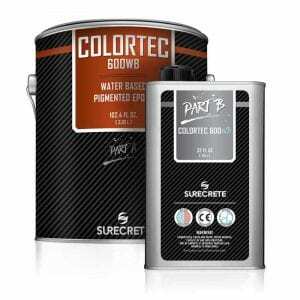 While Colortec 600WB is available in 250 colors, black being the most common color when applying a primer base coat. DK 500 is a 100% solids clear floor epoxy used to suspend the metallic pigments. Because of its thick build and high solids, it is able to suspend metallic pigments giving a rich 3d look with depth. 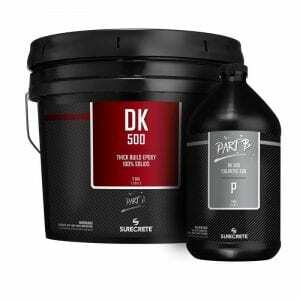 DK Metallic™ are mixed into SureCrete’s Epoxy 100% Solids kits. 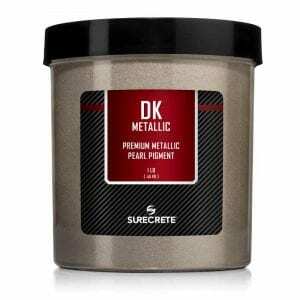 SureCrete’s DK Metallics’ are UV stable, easy to use and are available in ten rich, unique colors. DK 400 is a high gloss floor polyurethane that one of the most popular clear top coats for epoxy metallic flooring. Other options for a top coat could be DK 400WB, DK 120 and DK 180. 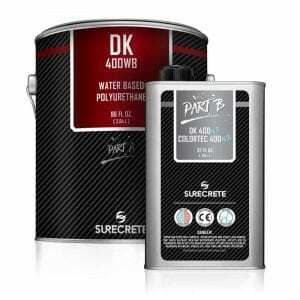 Also, to help maintain a high-gloss shine, SureCrete’s SureFinish™, an industrial floor wax could be applied. Speed and beauty are combined in this high traffic flake floor application. When using the products below, this fast dry coating system allows customers to have very transformed their floor into a clean, slip-resistant, highly-durable floor, ready to use in 18 hours. ColorTec 180™ is an ideal solution when time is of the essence. With incredible bond strength and a fast cure time, contractors are able to roll out the product, broadcast flake chip into it and be back on the floor in hours to clean up excess flakes and finish sealing. SureCrete’s DK Flakes are UV stable and when used in this system simply broadcast the flake into the applied polyaspartic, wait a few hours, and you are ready to remove any excess needed chips. Coverage can be anywhere from 10%, to complete full coverage, depending on your customers desired look. Because getting the job done quickly and efficiently, DK 120 and 180 are an excellent choice. With cure times from 2 to 4 hours, contractors can remove excess flakes and apply a high gloss topcoat, helping them get off the job in most cases, the same day. 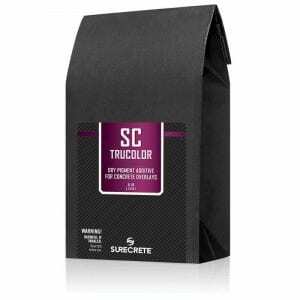 This SureCrete system, delivers the highest coating bond strength and environmentally friendly low VOC’s. A perfect choice for contractors who apply garage floors to veterinary floor and kennels. SureCrete’s Colortec 600WB is a Water-Bases Colored Epoxy that can be used as a primer base coat when broadcasting epoxy flakes. SureCrete colored epoxy is easy to clean up as well as a durable coat to hole the flakes into. Available in 12 standard colors, DK Flakes can be easily broadcasted into epoxy floor base coat with coverage varying from 10% all the way to 100% full coverage. For many contractors, SureCrete’ clear polyaspartic clear coat products are the preferred choice due to its ability to have a thick-build coverage that is durable and scratch resistance. Becoming more popular in 2017, wood looking concrete floors are a great option for traditional tile or wood planks. Below are some of the products contractors use to complete these floors. 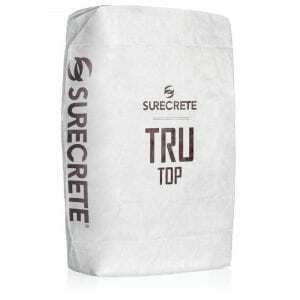 For interior wood looking concrete floors, SureCrete TruTop™ is the preferred choice because of it fine aggregates and ability to create a smooth finish while having the ability to create a rick wood-grain appearance. For outdoor applications, SureBroom™ or Suretex™ could be used to create a more textured finish. Trutop™ could be used with no color if a light end finish is desired. When trying to create a deep rich colored wood grain, adding SC TruColor color additive will help in creating virtually any color a customer desires. Getting a customer the exact wood grain color has never been easier. When using SureCrete’s Eco-Stain, a water-based colorant, the application can be applied with a brush, roller, sponge, and even sprayed. 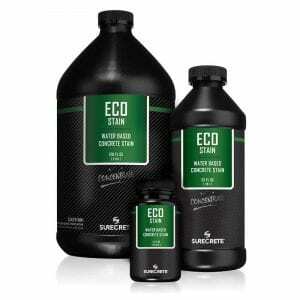 Available in 30 standard colors, EcoStain can be diluted with water to get the customer the wood color they are looking for. Finishing a customer interior concrete wood overlay floor is one of the most important steps. Customers require a floor that is scratch resistant, easy to clean, and will have that new look for years to come. SureCrete DK 400will do just that. For added gloss and scratch resistance, apply of SureCrete’s SureFinish™, a High-performance floor wax. This will help extend shine of the floor.